Scarves are a neglected accessory in Singapore. After all, it just doesn’t seem practical (or pleasant) to wrap an extra fabric around our necks in this humid climate. Here, the scarf is more practical than fashionable, used to shield ourselves from the freezing air conditioning of cinemas and malls before getting banished into our bags once we emerged through their doors. But here’s where we make a case for the humble scarf. Knotted correctly and with the right design, it can refresh your outfit, adding charm and dimension to your ensemble. Go with something lightweight and it can even be the perfect accessory to weather Singapore’s sun. We share seven ways you can rock this handy fabric with style. This is one of the easiest ways to wear a scarf. If you have a square piece, fold it in half so that it forms a triangle, drape it across your neck and tie the ends together at the back. If your scarf comes in a rectangular shape, coil it up, wrap it around your neck several times, depending on the length of your scarf, and then tightly secure it at the back of your neck. Make sure you go for a decorative scarf made of a thin material such as silk. Your neck will thank you for it. Wear it on your head like a breezy bohemian. Simply roll your long scarves into a cylindrical shape, wrap them around your head once (or twice depending on the length you desire to achieve) and neatly secure it with a double knot. You could also tie it around a high ponytail to add texture to your strands, or weave it into your bun for a sassy update to your summer look. For those with shorter hair, you can try the turban method with a square scarf. Fold it into a triangular shape and place it on your head — with the tip of the triangle pointing frontwards and the two longer ends resting at the nape of your neck. Bring the two ends to the front and tie a knot on top of the triangular tip. Flip the triangular tip to the back and then braid the three ends backwards. Secure that inside the scarf located at the nape of your neck. Similar to the first tip, the scarf goes around your neck. 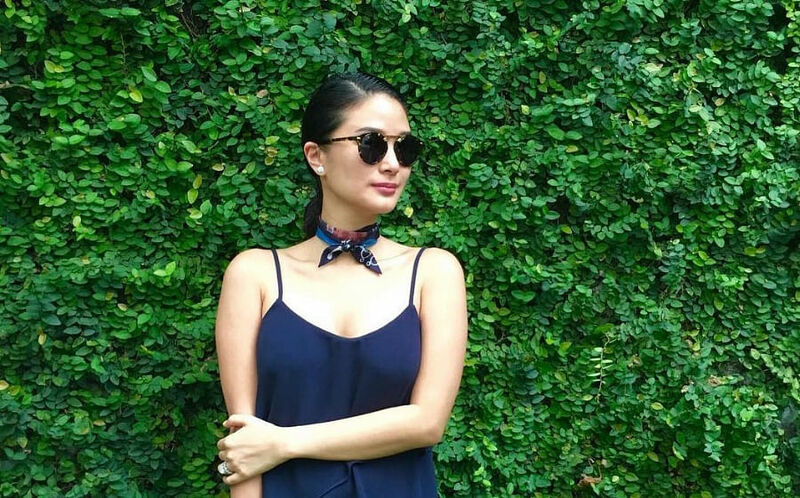 But this time, tie it like a choker instead — it instantly lends elegance to your formal wear. To do so, lay it flat, fold it into a triangle and start rolling it up into a flat, rectangular shape. Once you’re done, place it around your neck and secure the knot at the back. We recommend a smaller square scarf for this technique in order to neatly achieve this look. Exude a devil-may-care nonchalance with this method. All you have to do is throw a scarf over your shoulder and voilà: effortless chic. But to nail this look, we suggest going for a scarf that is made of faux fur (for the winter season when you’re travelling to somewhere cooler), or has baroque prints to add a pop of colour and detail. The front drape is one of the most commonly employed methods to tie a scarf. All you have to do is wind it around your neck (again, make sure it’s a lightweight scarf) and adjust the ends — you can make them even or asymmetrical, just like fashion celebrity Anna dello Russo. Simple, but classy. For us, we like to spice things up by clashing prints together. Go for a piece that sports more than two colours, or comes with crazy prints, so that it adds an interesting flair to your outfit. If you’re hitting the beach this weekend, work your scarf to its maximum potential by tying it as a bandeau. This method is super simple; all you have to do is to fold it in half, bring it around your chest and secure it at the front. If the ends of your scarf are too long, tie it into a bow to give a feminine air. Make a double knot for extra security. For a touch of panache, we’d recommend a printed silk scarf. If you’re a huge fan of Gossip Girl, you’d recall a scene where Blake Lively’s character, Serena van der Woodsen, was strolling around California in a maxi skirt (season 4, episode 22). That’s actually a scarf that has been ingeniously fashioned into a skirt. This look is easy to replicate. Start off with a large printed silk scarf. Bring the scarf around your waist and secure it with a double knot on the side. Pair it with a white t-shirt, a pair of strappy flat sandals and a large straw tote to elicit a holiday vibe. Below, shop some scarves that are deserving for your Singapore summer look.